Ubisoft - The gold edition includes the base game, Year 1 Pass, and three-day early access to the game. Tom clancy's the division 2 is an online action-shooter RPG experience, where exploration and player progression are essential. Save a country on the brink of collapse as you explore an open, and hostile world in Washington, dynamic, DC. Fight together with your friends in online co-op or against others in competitive PvP. Choose a unique class specialization to take on the toughest challenges with friends in a genre-defining endgame. Tom clancy’s the division 2 pre-order beta disclaimer: preorder any edition of Tom Clancy’s The Division 2 at participating retailers and platforms, strictly pursuant to the terms of the private beta phase to get access to it. Tom Clancy's The Division 2 Gold Edition Online Game Code - The fate of the free world is on the line in Tom Clancy’s The Division 2. Minimum – 1080p | 30 fps os: windows 7 | 8 | 10 cpu: amd fx-6350 | intel core i5-2500k ram: 8 gm gpu: amd radeon r9 270 | nvidia geforce gtx 670 vram: 2 gb direct x: directx 11 | 12 recommended – 1080p | 60 fps os: windows 7 | 8 | 10 cpu: amd ryzen 5 1500x | intel core i7-4790 ram: 8 gb gpu: amd rx 480 | nvidia geforce gtx 970 vram: 4 gb direct x: directx 11 | 12 high – 1440p | 60 fps os: windows 7 | 8 | 10 cpu: amd ryzen 7 1700 | intel core i7-6700k ram: 16 gb gpu: amd rx vega 56 | nvidia geforce gtx 1070 vram: 8 gb direct x: directx 11 | 12 elite – 4k | 60 fps os: windows 7 | 8 | 10 cpu: amd ryzen 7 2700x | intel core i9-7900x ram: 16 gb gpu: amd radeon vii | nvidia geforce rtx 2080 ti vram: 11 gb direct x: directx 11 | 12 **supported cpus at time of release: intel 2ndgen: intel core i5-2500k or better intel 3rdgen: intel core i5-3330 or better intel 4thgen: intel core i3-4350 or better intel 6thgen: intel core i3-6100 or better intel 7thgen: intel core i3-7100 or better intel 8thgen: intel core i3-8100 or better AMD FX series: AMD FX-6350 or better AMD Ryzen series: Ryzen 3 1200 or better *Supported GPU cards at time of release: GeForce GTX600 series: GeForce GTX670 or better GeForce GTX700 series: GeForce GTX760 or better GeForce GTX900 series: GeForce GTX950 or better GeForce GTX10-Series: GeForce GTX1050 or better GeForce RTX20-Series: GeForce RTX2070 or better Radeon 200 series: Radeon R9 270 or better Radeon 300/Fury X series: Radeon R9 380 or better Radeon 400 series: Radeon RX 460 or better Radeon Vega series: RX Vega 56 or better Radeon VII series Important note: Series or models of CPUs/GPUs not covered by the list above, are not officially supported and may not be able to run the game at all or in optimal conditions, due to technical limitations. Subject to availability and while supplies last. Ubisoft - Subject to availability and while supplies last. Void where prohibited or restricted. The ultimate edition includes additional digital content, the Year 1 Pass, and three-day early access to the game. Includes the elite agent Pack with exotic assault rifle, unique skill effect, and additional stash space. Includes the battleworn secret Service Pack with Battleworn Secret Service outfit, emote, and weapon skin. Fight together with your friends in online co-op or against others in competitive PvP. Also includes the first Responder Pack with First Responder outfit and First Responder weapon skin. Content and system requirements pending; check all requirements/details/restrictions prior to purchase/redemption. Lead a team of elite agents into a post-pandemic Washington, DC, to restore order and prevent the collapse of the city. 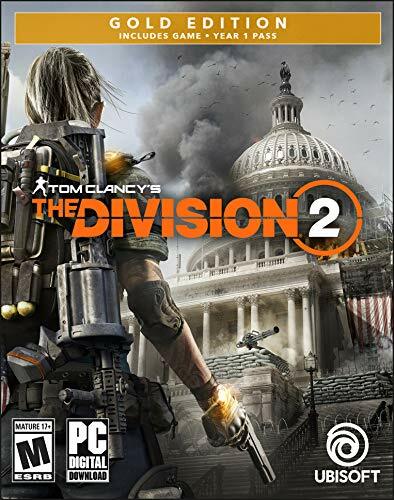 Tom Clancy's The Division 2 Ultimate Edition Online Game Code - Minimum – 1080p | 30 fps os: windows 7 | 8 | 10 cpu: amd fx-6350 | intel core i5-2500k ram: 8 gm gpu: amd radeon r9 270 | nvidia geforce gtx 670 vram: 2 gb direct x: directx 11 | 12 recommended – 1080p | 60 fps os: windows 7 | 8 | 10 cpu: amd ryzen 5 1500x | intel core i7-4790 ram: 8 gb gpu: amd rx 480 | nvidia geforce gtx 970 vram: 4 gb direct x: directx 11 | 12 high – 1440p | 60 fps os: windows 7 | 8 | 10 cpu: amd ryzen 7 1700 | intel core i7-6700k ram: 16 gb gpu: amd rx vega 56 | nvidia geforce gtx 1070 vram: 8 gb direct x: directx 11 | 12 elite – 4k | 60 fps os: windows 7 | 8 | 10 cpu: amd ryzen 7 2700x | intel core i9-7900x ram: 16 gb gpu: amd radeon vii | nvidia geforce rtx 2080 ti vram: 11 gb direct x: directx 11 | 12 **supported cpus at time of release: intel 2ndgen: intel core i5-2500k or better intel 3rdgen: intel core i5-3330 or better intel 4thgen: intel core i3-4350 or better intel 6thgen: intel core i3-6100 or better intel 7thgen: intel core i3-7100 or better intel 8thgen: intel core i3-8100 or better AMD FX series: AMD FX-6350 or better AMD Ryzen series: Ryzen 3 1200 or better *Supported GPU cards at time of release: GeForce GTX600 series: GeForce GTX670 or better GeForce GTX700 series: GeForce GTX760 or better GeForce GTX900 series: GeForce GTX950 or better GeForce GTX10-Series: GeForce GTX1050 or better GeForce RTX20-Series: GeForce RTX2070 or better Radeon 200 series: Radeon R9 270 or better Radeon 300/Fury X series: Radeon R9 380 or better Radeon 400 series: Radeon RX 460 or better Radeon Vega series: RX Vega 56 or better Radeon VII series Important note: Series or models of CPUs/GPUs not covered by the list above, are not officially supported and may not be able to run the game at all or in optimal conditions, due to technical limitations.
. Terms and conditions strictly apply and will be communicated at a later date, as determined by Ubisoft. Ubisoft - Content and system requirements pending; check all requirements/details/restrictions prior to purchase/redemption. The fate of the free world is on the line in Tom Clancy’s The Division 2. Subject to availability and while supplies last. Minimum – 1080p | 30 fps os: windows 7 | 8 | 10 cpu: amd fx-6350 | intel core i5-2500k ram: 8 gm gpu: amd radeon r9 270 | nvidia geforce gtx 670 vram: 2 gb direct x: directx 11 | 12 recommended – 1080p | 60 fps os: windows 7 | 8 | 10 cpu: amd ryzen 5 1500x | intel core i7-4790 ram: 8 gb gpu: amd rx 480 | nvidia geforce gtx 970 vram: 4 gb direct x: directx 11 | 12 high – 1440p | 60 fps os: windows 7 | 8 | 10 cpu: amd ryzen 7 1700 | intel core i7-6700k ram: 16 gb gpu: amd rx vega 56 | nvidia geforce gtx 1070 vram: 8 gb direct x: directx 11 | 12 elite – 4k | 60 fps os: windows 7 | 8 | 10 cpu: amd ryzen 7 2700x | intel core i9-7900x ram: 16 gb gpu: amd radeon vii | nvidia geforce rtx 2080 ti vram: 11 gb direct x: directx 11 | 12 **supported cpus at time of release: intel 2ndgen: intel core i5-2500k or better intel 3rdgen: intel core i5-3330 or better intel 4thgen: intel core i3-4350 or better intel 6thgen: intel core i3-6100 or better intel 7thgen: intel core i3-7100 or better intel 8thgen: intel core i3-8100 or better AMD FX series: AMD FX-6350 or better AMD Ryzen series: Ryzen 3 1200 or better *Supported GPU cards at time of release: GeForce GTX600 series: GeForce GTX670 or better GeForce GTX700 series: GeForce GTX760 or better GeForce GTX900 series: GeForce GTX950 or better GeForce GTX10-Series: GeForce GTX1050 or better GeForce RTX20-Series: GeForce RTX2070 or better Radeon 200 series: Radeon R9 270 or better Radeon 300/Fury X series: Radeon R9 380 or better Radeon 400 series: Radeon RX 460 or better Radeon Vega series: RX Vega 56 or better Radeon VII series Important note: Series or models of CPUs/GPUs not covered by the list above, are not officially supported and may not be able to run the game at all or in optimal conditions, due to technical limitations. Promotional offer. Tom clancy’s the division 2 pre-order beta disclaimer: preorder any edition of Tom Clancy’s The Division 2 at participating retailers and platforms, strictly pursuant to the terms of the private beta phase to get access to it. Void where prohibited or restricted. Terms and conditions strictly apply and will be communicated at a later date, as determined by Ubisoft. Bethesda US-E3-PC-2018-060518-003 - Do you protect or unleash the power of the atom? The choice is yours. This destruction also creates a high-level zone with rare and valuable resources. Game will be playable on 11/14/18. You will emerge! multiplayer finally comes to the epic open world rpgs of bethesda Game Studios. Do you protect or unleash the power of the atom? The choice is yours. You can even set up shop to trade goods with other survivors. To build and craft anywhere in the world. You can even set up shop to trade goods with other survivors. Will provide much-needed shelter, supplies, and safety. Whether you journey alone or with friends, a new and unique Fallout adventure awaits. Mountain splendorland! all-new graphics, lighting and landscape technology brings to life six distinct West Virginia regions. Fallout 76 Digital Code - Reclamation Day, 2102. Create your character with the S. P. E. C. I. A. - Your C. A. M. P. This destruction also creates a high-level zone with rare and valuable resources. Will provide much-needed shelter, and safety. A new american dream! use the all-new construction and assembly mobile platform c. A. M. P. The ultimate edition includes additional digital content, the Year 1 Pass, and three-day early access to the game. Includes the elite agent Pack with exotic assault rifle, unique skill effect, and additional stash space. Includes the battleworn secret Service Pack with Battleworn Secret Service outfit, emote, and weapon skin. Fight together with your friends in online co-op or against others in competitive PvP. Also includes the first Responder Pack with First Responder outfit and First Responder weapon skin. $50 Battle.net Store Gift Card Balance Online Game Code - Tom clancy's the division 2 is an online action-shooter RPG experience, where exploration and player progression are essential. Save a country on the brink of collapse as you explore an open, dynamic, and hostile world in Washington, DC. Fight together with your friends in online co-op or against others in competitive PvP. Choose a unique class specialization to take on the toughest challenges with friends in a genre-defining endgame. Want more? upgrade to the gold edition, featuring a Year 1 Pass with additional digital content and three-day early access to the game. Pre-load: download the game now. Rockstar Games - Game will be playable on 11/14/18. You will emerge! multiplayer finally comes to the epic open world rpgs of bethesda Game Studios. From the creators of grand theft auto v and Red Dead Redemption, Red Dead Redemption 2 is an epic tale of life in America at the dawn of the modern age. Will provide much-needed shelter, and safety. A new american dream! use the all-new construction and assembly mobile platform c. A. M. P. The red dead redemption 2: special edition delivers exclusive content for story mode including a Bank Robbery Mission and Gang Hideout, Talisman & Medallion Gameplay Bonuses, Dappled Black Thoroughbred, and the Nuevo Paraiso Gunslinger Outfit, Cash Bonuses & Discounts, Gameplay Boosts, plus free access to Additional Weapons. PS4 Digital Code - Red Dead Redemption 2: Special Edition - You can even set up shop to trade goods with other survivors. But beware, supplies, not everyone will be quite so neighborly. The power of the atom! go it alone or with fellow survivors to unlock access to the ultimate weapon - Nuclear Missiles. Sourced by metacritic the ultimate edition includes additional digital content, the Year 1 Pass, and three-day early access to the game. Includes the elite agent Pack with exotic assault rifle, unique skill effect, and additional stash space. Includes the battleworn secret Service Pack with Battleworn Secret Service outfit, emote, and weapon skin. Fight together with your friends in online co-op or against others in competitive PvP. - Note: Battle. Net gift cards can only be redeemed into US registered user accounts. Load up your battle. Net balance, character services, in-game items, then use it on Blizzard Entertainment games, and more. Battle. Net balance is simple and convenient to use. Use battle. Net balance to buy world of warcraft realm transfers and other paid services, as well as digital versions of Blizzard games like Diablo III and StarCraft II. You can also use battle. Net balance to buy items in games like World of Warcraft and Hearthstone. You can even set up shop to trade goods with other survivors. Post-nuclear America has never looked so beautiful! Your C. A. M. P. A new american dream! use the all-new construction and assembly mobile platform c. A. M. P.
- Galactic-scale space combat space combat has been designed for Star Wars Battlefront II from the ground up with distinct handling, weapons and customization options. Rush through waves of enemies on Starkiller Base with the power of your lightsaber in your hands. You can even set up shop to trade goods with other survivors. Join your squadron and weave in between asteroids fields, fly through Imperial Dock Yards and take down massive capital ships as you pilot legendary starfighters in high stakes dogfights with up to 24 players and 40 AI ships. Will provide much-needed shelter, and safety. Experience rich and living Star Wars multiplayer battlegrounds across all three eras: prequel, classic, and new trilogy. Star Wars Battlefront II Online Game Code - This destruction also creates a high-level zone with rare and valuable resources. Create your character with the S. P. E. C. I. A. L system and forge your own path in a new and untamed wasteland with hundreds of locations. Use these abilities to adapt and modify your character’s powers, or tactical assistance, either as lethal active effects on your opponents, helpful status boosts, to counter any opponent on the battlefront.